All people have the right to safely travel on our streets. Many people in Seattle are seriously injured on exposed streetcar tracks in Seattle. We need our city to build and maintain streets we can all use safely. (1) Immediately, Seattle Department of Transportation (SDOT) needs to provide continuous, intuitive, protected bike lanes on Yesler between 14th & Broadway to protect people biking from the streetcar tracks. 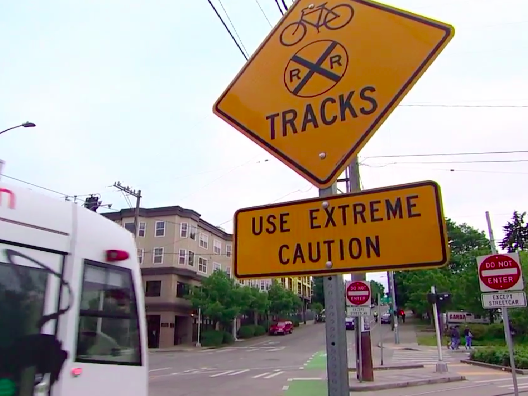 (2) The City of Seattle must provide safe bike routes and crossing wherever there are train tracks in the street. Far too many people have been seriously injured or died on our streets when forced to bike in the same space provided for streetcar tracks. It doesn't have to be this way. Solutions exist to make our streets safer. Join us in asking the Seattle leaders to make #SafeTracks for Safer Streets. We need #CompleteStreets now. #WeCantWait for more injuries or fatalities. OPTIONAL: What neighborhood do you identify with most? Get updates about what is happening with the neighborhood you identify with most. What micro-neighborhood do you identify with? Please select which part of Ballard you identify with. Please select which part of Beacon Hill you identify with. Please select which part of Capitol Hill you identify with. Please select which part of the Central District you identify with. Please select which part of Delridge you identify with. Please select which part of the Downtown Area you identify with. Please select which part of Lake City you identify with. Please select which part of Lake Union you identify with. Please select which part of Madrona you identify with. Please select which part of Magnolia you identify with. Please select which part of Montlake you identify with. Please select which part of NE Seattle you identify with. Please select which part of Queen Anne you identify with. Please select which part of Rainier Valley you identify with. Please select which part of West Seattle you identify with (Delridge is listed as a separate neighborhood from West Seattle, if that is your neighborhood please select that in the box above). Please select where from outside of Seattle you identify with.